Ronald van der Meijs: Coming up; Group exhibition LOS MAQUINISTAS in Madrid, Spain. 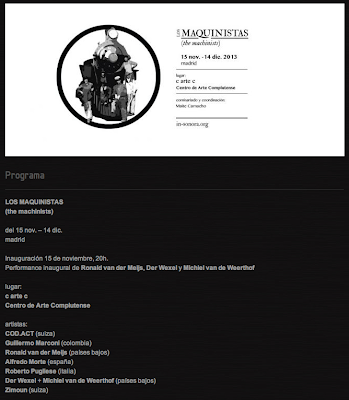 Coming up; Group exhibition LOS MAQUINISTAS in Madrid, Spain. A group show at C arte C, Centro de Arte Complutense, Madrid. With an opening performance of Der Wexel, Michiel van de Weerthof and Ronald van der Meijs on 15th of november. starts at 8 pm. Exhibition from 15 november - 14 december 2013.